Background In Western countries, work disability due to depression is a widespread problem that generates enormous costs. 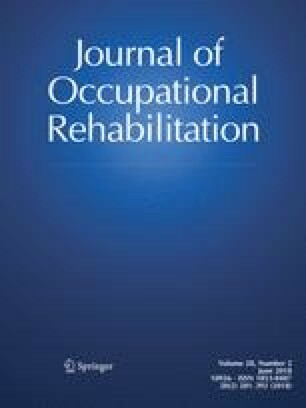 Objective The goal of this study was to determine the types and prevalence of supervisor contributions during the different phases of the return-to-work (RTW) process (before and during the sick-leave absence, and during the RTW preparations) of employees diagnosed with depression. Moreover, we sought to determine which contributions actually facilitate employees’ RTW, and to identify the work accommodations most frequently implemented by supervisors at the actual time of their employee’s RTW. Methods Telephone interviews were conducted in Québec (Canada) with 74 supervisors working with employees who were already back at work or still on sick leave due to depression. A sub-sample of 46 supervisors who had already taken measures to facilitate their employees’ RTW was questioned about the work accommodations implemented. Results Most of the supervisors got along well with their employees before their sick leave and 72% stayed in contact with them during their leave. Nearly 90% of the supervisors encouraged their employees to focus primarily on their recovery before their RTW, but 43% pressured their employees to RTW as soon as possible. Cox regression analyses performed for the entire sample revealed that “the supervisors’ intention to take measures to facilitate their employees’ RTW” was the only significant predictor of the RTW at the time of the interview. The Kaplan–Meier survival curve showed that 50% of the employees were expected to RTW within the first 8 months of absence. Four of the most frequently implemented work accommodations were actions directly involving the supervisor (i.e. providing assistance, feedback, recognition, and emotional support to the employee). Conclusions This study shed light on the less explored point of view of the supervisor involved in the RTW process of employees post-depression. It highlighted the most frequent and effective supervisor contributions to the process. These results can be used to develop concrete action plans for training supervisors to contribute to the sustainable RTW of employees on sick leave due to depression. We wish to thank all the individuals who participated in the interviews conducted as part of this study. This work was supported by a funding grant from the Canadian Institutes of Health Research (CIHR). Alessia Negrini, Marc Corbière, Tania Lecomte, Marie-France Coutu, Karen Nieuwenhuijsen, Louise St-Arnaud, Marie-José Durand, Andrea Gragnano, and Djamal Berbiche, declare that they have no conflict of interest. All procedures performed in studies involving human participants were conducted in accordance with the ethical standards of the Centre hospitalier universitaire de Sherbrooke (human research ethics committee). British Health and Safety Executive. Element 2: keeping in contact. In: Managing sickness absence and return to work. British Health and Safety Executive 2004. http://www.hse.gov.uk/sicknessabsence/step2.htm. Accessed 24 Aug 2016.